-Coyote substitutes for all other symbols except scattered Loots. 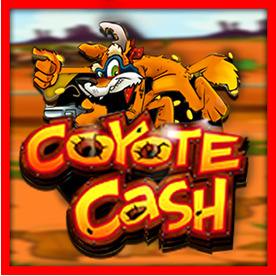 -The prize is double when one or more coyotes substitutes in a winning combination. -All symbols pay Left to Right except scattered Loots, which pay any. -Line wins are miltiplied by bet per line. -20 free games are awarded when 3 or more scattered Loots appear anywhere. -Prizes are multiplied by 2,3 or 4 during the free game for 3,4 or 5 triggering Loots, respectively. -Additional free games can be won during the feature and are played at the initial multiplier. -Free games are played at the lines and bet of triggering game. -Random Jackpot contribution is no more than 1.5 of total Return to Player.